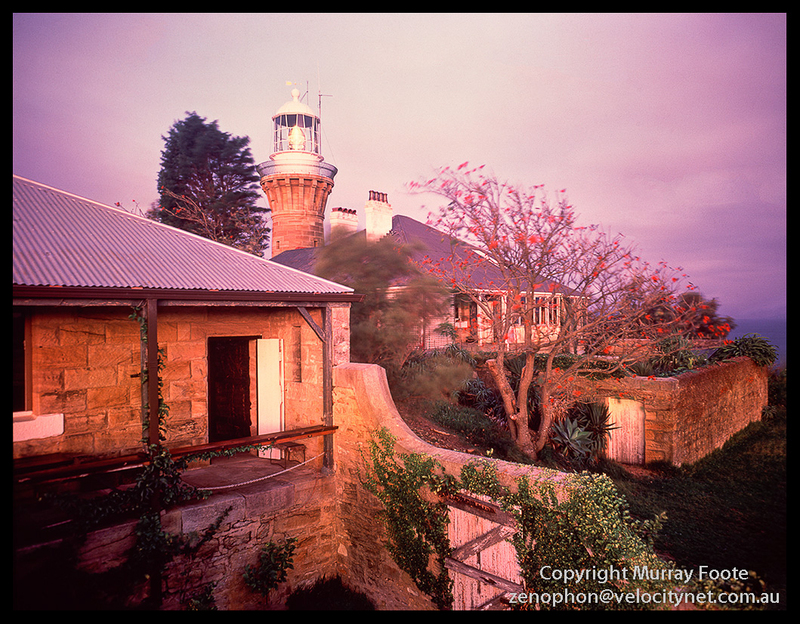 On the 15th June 1987 I came to Barranjoey lighthouse, at a small peninsula near Palm Beach, on the very northern edge of Sydney. The lighthouse was built in 1881, primarily to protect the entrance of Broken Bay, which while never a significant port, could be used as a refuge by ships in a storm. The lighthouse was automated as early as 1932 and the houses let out from 1960 to 1997. Since that date the houses and headland (though not the lighthouse itself) have been managed by the New South Wales National Parks and Wildlife Service. It was late afternoon when I got there and I went a bit cross-country, climbing up a small cliff to get there. According to The Photographer’s Ephemeris, the time I have recorded here for this location and date is 20 minutes after sunset. The tree with the red blossoms is an Illawarra Flame Tree (brachychiton acerfolius). The lighthouse and cottages are unpainted sandstone. While I was taking the photograph, I got to meet Jervis Sparks, who was renting out Assistant Lighthouse Keeper’s Cottage No 2, at the left here. He had been living here for nearly twenty years at this time and had to leave ten years later when the Parks and Wildlife Service took over ownership. He had restored the cottage from a derelict state to authentic nineteenth century condition and invited me in for a cup of tea. The internal walls were also unpainted sandstone and he had eschewed electricity for gas lamps and a wood-fired stove. It was like living in a natural museum and a great privilege to visit. It was three days off the full moon but the moon did not rise until 8:30pm. I walked back along the lighthouse road and because the road was completely surrounded by trees, it was completely dark there and I did not have a torch. The complication was that the road was exceptionally rough, even for a four wheel drive track. For each step, I had to balance on one leg and carefully lower the other one to find out where it would land. The drop for each step was quite variable and sometimes considerable. It must have taken me quite a while to walk out. This entry was posted in Australia, From Dusk Till Dawn and tagged Architecture, Australia, Barranjoey, History, Landscape, Lighthouses, New South Wales, Palm Beach, Photography, seascape, Sydney, Travel.